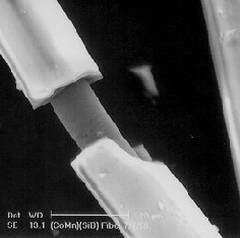 Microwires 3 to 5 times thinner than a human hair are being studied as a possible data storage alternative to CD-ROMs. Microwire technology originated in the old Soviet Union; they are now being studied elsewhere (like the University of Basque Country [EHU]). Microwires are made of ferromagnetic alloy and encased in glass. The magnetic bistability associated with a circular "bamboo-like" makes it possible to create a long string of tiny segments that can be selectively magnetised. This makes a 1/0 bit possible. Researchers calculate that a ten centimeter microwire can be divided into ten million segments; each segment could store a bit. Researchers admit that the technology has difficulties; reading the information back will be difficult. In his 1951 novel Between Planets, author Robert Heinlein wrote about microwires that were used to store vast amounts of information. Also, in his 1965 novel Dune, Frank Herbert wrote about shigawire, a very thin (and very strong) wire that could be used as a data storage medium. Wire recorders were the precursor to tape recorders; the concept was first demonstrated in the 1870's using piano wire. The military used wire recorders very successfully during World War II and they were the first commercially successful form of recording device available to the public. If you liked this topic, you might be interested in reading an earlier SF in the News story - Nanowire Memory Cells, detailing recent research by scientists at USC and the NASA Ames Research Center. Read more about the experimental microwire technology at Microwires: replacement for the CD ROM?.